The #1 Stereoscopic 3D Gaming (VR Gaming, 3D Gaming) and VR Resource | Meant to be Seen - iZ3D News, Vista Upgrade! Two iZ3D LLC stories for you today. First, iZ3D is sponsoring PDXLAN 12, the largest LAN party on the west coast. Among the prizes will be two 22" widescreen 3D iZ3D monitors. 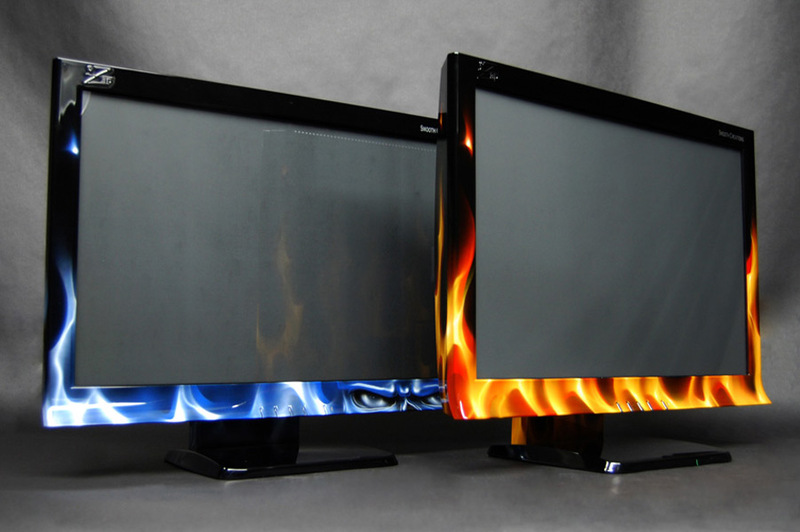 Why are these monitors so special, you ask (aside from the obvious reasons)? Look at them! Specifications include: 1680 x 1050 resolution; up to 170-degree 3D viewing angle; 5ms response time; 700:1 contrast ratio; and 16.7-million colors. Custom painted by Smooth Creations, these hot-rod monitors will be the envy of their owners’ block. If you are into 3D movies, mark July 11th, 2008 7:30PM on your calendar. TWO HUNDRED lucky people will enjoy a free premier of Journey to the Center of the Earth at the San Diego Miramax IMAX Digital 3D Theater. Afterwards, attendees will be able to sample and play games on the iZ3D monitor in person to see what all the exciting fuss is about in the theater lobby. Click HERE to register. Finally, I have updated my testing system to Windows Vista Home Premium. There is a method to my madness (madness, I tell you! ), and you will learn why in a matter of days. Exciting announcements around the corner at MTBS. In the meantime, I created special Vista and XP forums for you to post in to help fellow members with their troubleshooting and game performance concerns. I’d be personally appreciative if you could post or link to Vista tweaking guides to help improve gaming performance HERE.